A glowing cloud of dust and gas surrounding a star towards the end of its life cycle. A glowing cloud of dust and gas surrounding a star towards the end of its life cycle. When a large star has used up most of its hydrogen in nuclear fusion, the outer layers of its atmosphere are violently ejected, and ionized by the radiation from the remaining core. These planetary nebula are very short lived in cosmic terms, lasting perhaps a few tens of thousands of years. When a large star has used up most of its hydrogen in nuclear fusion, the outer layers of its atmosphere are violently ejected, and ionized by the radiation from the remaining core. 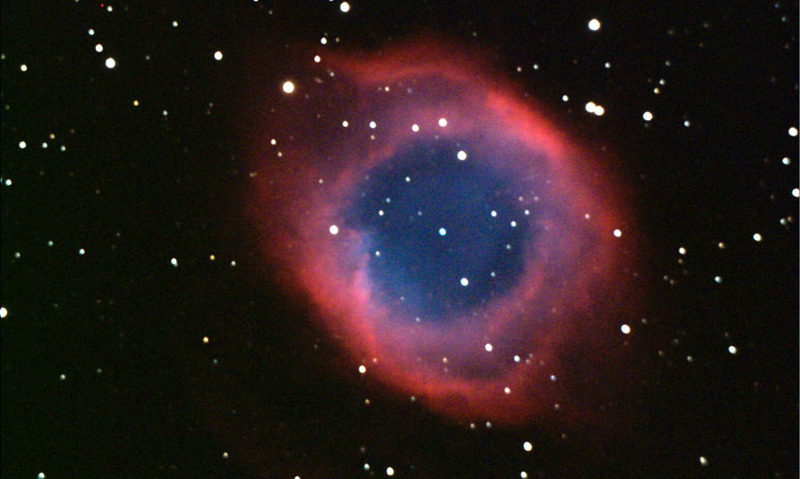 These planetary nebula are very short lived in cosmic terms, lasting perhaps a few tens of thousands of years.